New chiral 1,10-phenanthroline-derived ligands containing fragments of (+)-3-carene (L1) and (+)-limonene (L2) natural monoterpenoids and their complexes Zn(L1,2)Cl2·1.5H2O, Cd(L1,2)Cl2·nH2O, Zn(L1)Br2·2H2O, and Cd(L1)Br2·2H2O were synthesized. 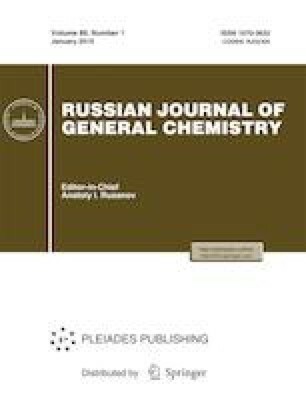 According to NMR and IR spectroscopy data, a conclusion was made about the polynuclear structure of the compounds obtained. Luminescent properties of the compounds obtained were investigated. Lifetimes of the excited states and luminescence quantum yields (φf) were determined. For free ligands, blue fluorescence was observed. In the case of Zn(II) and Cd(II) complexes, luminescence appeared in the green region of the spectrum. Russian Text © T.E. Kokina, Yu.P. Ustimenko, M.I. Rakhmanova, L.A. Sheludyakova, A.M. Agafontsev, P.E. Plyusnin, A.V. Tkachev, S.V. Larionov, 2019, published in Zhurnal Obshchei Khimii, 2019, Vol. 89, No. 1, pp. 100–109.